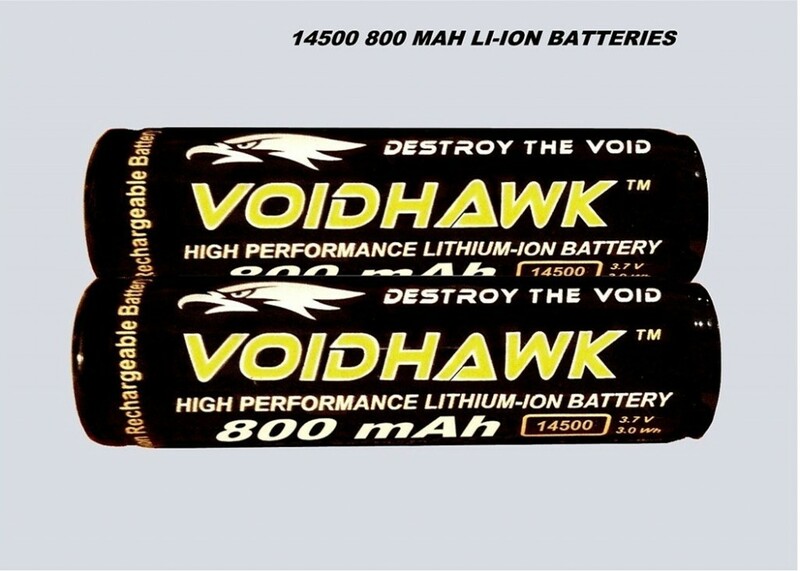 The market for high power 14500 lithium ion batteries is flooded with reclaimed batteries from old laptop battery packs being sold as new with extremely high and misleading mAh ratings. These cheaper reclaimed batteries are at the end of their recharge / discharge cycle lifetimes and will not last for the 800 cycles a true brand new 14500 li-ion battery should. MAh ratings are a measure of the storage capacity of a battery down to a certain voltage. 14500 li-ion rechargeable batteries have an operating range of ~2.7v - 4.2 volts max. You should never discharge a rechargeable 14500 li-ion battery lower than 2.5v. When you see rechargeable 14500 batteries with extremely high mAh ratings (over 800) it's usually because they are rated down to 1 volt or less. The TRUE way to measure the mAh rating on a 3.7v 14500 rechargeable battery is to the end of its safe operating voltage which is ~2.7 volts. * Please Note: Currently it is impossible to make a rechargeable 14500 3.7v li-ion battery over 800 mAh capacity. Any 14500 Li-Ion Rechargeable Battery advertised over 800 mAh Capacity is not using the proper rating system on their batteries. We have found in our market testing that even batteries claiming to have a mAh rating within what is actually possible in reality are rating them 2 or 3 times what their actual capacity is if measured within their designated operating range. Many batteries being sold on the open market claim to be "protected" batteries but do not contain the necessary protection circuit board on the negative terminal to actually be "digitaly protected". The only protection an 14500 li-ion battery has without the extra protection circuit board attached to it is a built in pressure release electrolyte venting system designed to prevent the battery from exploding if overcharged. It will however vent electrolyte violently! This is why it's important to be sure your batteries contain a built in protection circuit board on the negative terminal. 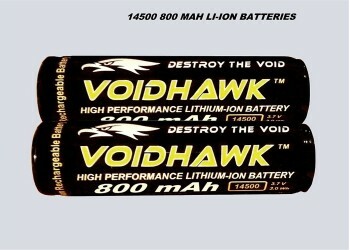 You can never short-circuit, over-charge, or over-discharge a genuine Voidhawk™ Brand 3.7v 14500 Lithium-Ion Battery.